Kitsilano Showboat « Vancouver Spotlight – Your Station! Your Stories! « Are You Our Next Style Spy Girl? 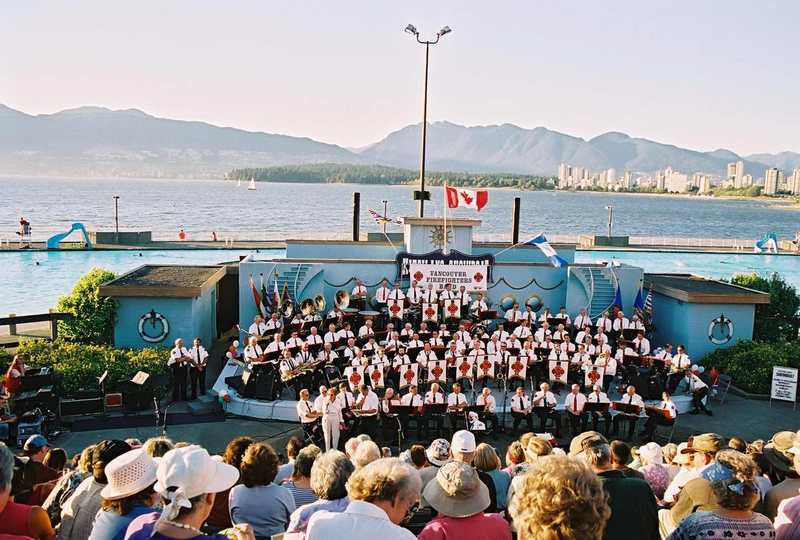 Fun times are had at Showboat, a local tradition here in Vancouver since 1935 when a stage was put up along Cornwall Avenue and local performers, musicians, and actors could do their thing in front of an enthusiastic audience. The Showboat is a beautiful open-air amphitheatre with the ocean and mountains providing a natural backdrop. Throughout the summer, Showboat hosts free performances in a range of mediums for its residents and tourists, generally sprung from local amateur talent. Weather permitting, shows most often start at 7:30 p.m. on Mondays, Wednesday, and Fridays, with special performances on the fireworks nights: Wednesdays and Saturdays. Heather Bissonnette of Novus TV is one of the revelers at Kits Beach, where acoustic guitars soothe the crowd into the sunset, and adoring families clap their little dancers on as they flit across the stage. Hot Breakfast, a Canadian band, explains how they have “been trying to get on Showboat for four years now…and they finally cracked it, and it was everything…Just being here, its the top place in the world, we look out at the scene and there’s no other place…nicer on the planet than here tonight.” By the looks on the faces of the crowd, let alone the footage of Vancouver on the water, one might be inclined to agree. Although this summer has left us, make sure you wander down next summer to partake in the beautiful setting and the local talent at Showboat, if you haven’t already experienced its bliss before. visit www.kitsilanoshowboat.com for more information. This entry was written by vanspotlight and posted on October 1, 2008 at 7:06 am and filed under Arts, Family Activities, Music, Outdoor Activities with tags boat, Cornwall Ave., dance, eveing, Kitsilano, kitsilano showboat, outdoor, performers, show, theatre. Bookmark the permalink. Follow any comments here with the RSS feed for this post. Post a comment or leave a trackback: Trackback URL.